I remember the first time I visited Santa Monica so clearly...a 22 year old version of me, bright eyed, and gearing up to spend 6 months of my life stateside. Prior to that particular visit to Santa Monica, I had been to LA twice, but didn't venture out of Beverly Hills because of time restrictions. When I planned my trip back, I made it a point to book beach front accommodation to experience a different part of greater Los Angeles. I chose to stay in Santa Monica and because of my experience that week, I have done this every year since. For Australians, travelling to the US usually means an initial stop over in LA. After a long haul flight, some travellers prefer to bash out the rest of the journey to the East Coast instead of staying in the City of Angels any longer than they need to. This means skipping California altogether, and spending an additional 6 hours in flight after the gruelling 16 hour journey into LAX. This used to be me - always in a hurry to get back to fast and noisy New York City. But there's this thing that's been happening to me over the past few years, and I'm pretty sure it's called getting older. I have a deep appreciation for my annual stop over in Santa Monica. It's my doorway into the USA and there's something about the energy in this town that makes me feel welcome and alive. Every year in the lead up to revisiting my old stomping grounds, I can't help but reminisce on my favourite ways to spend my time in this small but beautiful part of LA. Even if you can only fit in a 2 night stay, it's worth it. It's perfect for the lone traveller, duo, or family. If you're not yet convinced, here's what makes my heart flutter and keeps me coming back each year. The Beach Front Hotel Culture I love researching accommodation in Santa Monica, because of the beach front hotel culture. 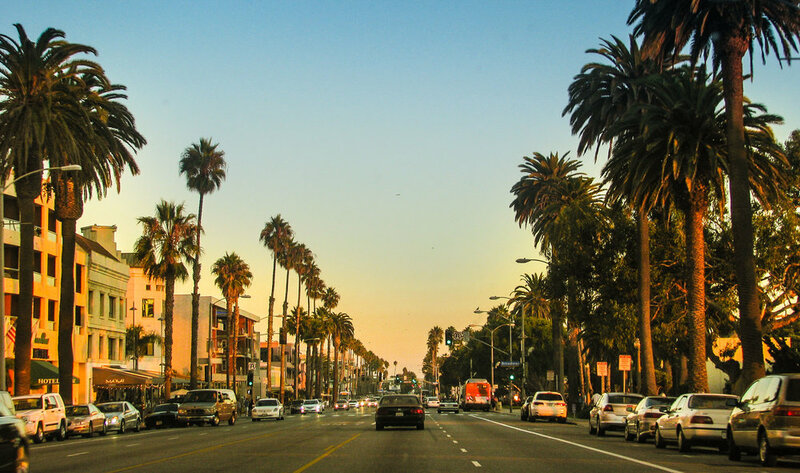 Unlike most of greater LA, Santa Monica is one of those places where you have everything you need for a short (or long) stay within walking distance - the beach, shopping, great food and awesome nightlife. I've spent a few nights across a range of hotels including the luxurious Casa Del Mar; the Viceroy Hotel that was a longer walk away from the Santa Monica shopping hub, but perfect if you want to take advantage of stunning hotel facilities; the Shangri-La Hotel that had me feeling as though I was playing a part on Melrose place - quintessential californian design. On my bucket list is Shutters on the Beach... maybe this year? Third Street Promenade You know when you're packing your bags, and discerning what to take with you versus what to buy as soon as you get there? Well this is where I go for the things I need to buy as soon as I get there. This includes (but is not limited to) my first hit of MAC makeup, picking up basics at Urban Outfitters, and the usual hour long browsing session at Anthropology (now shipping to Australia. yes!) Top it off with some live music, this outdoor mall is exactly what I think of when it comes to California cool and the best of American shopping. Fresh fruit and Vegetables I have never been able to agree or take place in discussions about the food being terrible in the US. If you're having repeated bad experiences with food, you're to blame. You've probably been eating at chain restaurants, ordering the same stuff, city to city. You should never wait till you're hungry to decide what you want to put into your body, especially while travelling! Nobody actually wants to feel sluggish and unhealthy on holiday. This is why California is, by far, my favourite place for food in the US. Most American grown produce comes from California, making fruit and veggies irresistible in this part of the country. Something as simple as a visit to my favourite American grocer Whole Foods will quickly change your mind about eating on the go. The Weather I have visited in winter, spring, summer and autumn, and each time has been a pleasant experience. Even in the Winter, I still recommend waking up early to enjoy a coffee and walk to the beach. If there's one place to people watch in LA, let this be it: early morning joggers, hopeful actors taking their dogs for walks, and the super fit folk who probably run twice a day. With an average high of 30 degrees celsius in summer 20 in winter, It's not too hard to pack accordingly. The Santa Monica Pier is one of my favourite places to spend an afternoon, and watch the sun set...and on a clear day, hot or chilly, there's nothing quite like it.